What better way to tee off with the kids than doing it while making your way down a mountain slope? 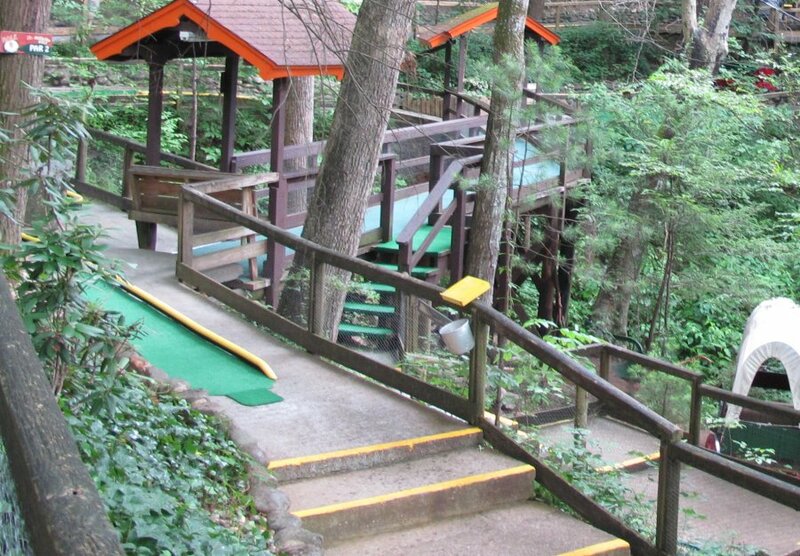 At Hillbilly Golf in Gatlinburg, that’s exactly what you’ll be doing and enjoying every minute.To access the two courses, you’ll take a funicular tram up the 300-foot incline to the top. The ride up gives everyone an idea about the landscape, the slope of the mountain you’ll be playing against – and how challenging it will be to keep your golf ball on course! When you arrive, you’ll have access to a free parking lot so there’s no worry about finding a spot. The ticket center is conveniently located nearby where you’ll purchase tickets and prepare to head to the courses. Restrooms are available at the ticket center. Note, there are no restroom facilities once you arrive at the golf courses. At the top of the mountain when you disembark, your party will be taken by rail buggy to the course locations where you’ll choose between one of the two courses. Both offer a challenge as you make your way through the greens to the final hole. Once you’ve played through all 18 holes, you’ll head back to the tram area where you’ll board another tram to descend mountainside back to the ticket center below – or, you can tackle the second course to show off more of your miniature golf playing techniques. Celebrating its 47th season. the course at Hillbilly Golf has been offering family fun and exciting challenges for all ages amid a lush and scenic landscape with views of Gatlinburg down below. There are two 18-hole courses to choose from with each designed with plenty of visual effects. The theme of the courses is a blend of hillbilly culture and an old-school farm atmosphere, which provides an up-close look at a part of Tennessee history. Between playing golf on a terraced and continuous downhill slope and maneuvering around a variety of obstacles, the course has players strategizing on each move, which adds to the action and excitement of the game. As you navigate the downhill course, be prepared to encounter unusual hillbilly hazards along the way. You may come upon a vintage still that may have been used to brew up some tasty beverages back-in-the-day, makeshift outhouses that were a standard and traditional necessity when living without indoor plumbing, funny exhibits like the Hillbilly Pickup Sticks made up of broken branches due to high winds, and a variety of pieces of antique farm equipment, to name just a few. Depending on the season, you may be playing amid the colorful process of the changing of the leaves during the fall, flowering buds in the spring, or the native greenery inhabiting Tennessee mountainsides in the summer. Hillbilly Golf closes during the coldest winter months. It is open in November and may have limited weekend hours in December, depending on the weather. When the temperatures are inviting and the possibility of a snow-covered golf course is no longer a threat, the courses are open seven days a week from morning till late night. The course operates rain or shine but will close if thunderstorms producing lightning is taking place. In this case, rain checks are available. For the latest information check their Facebook page.